"Japanese buckwheat flour noodles with chicken at their best! 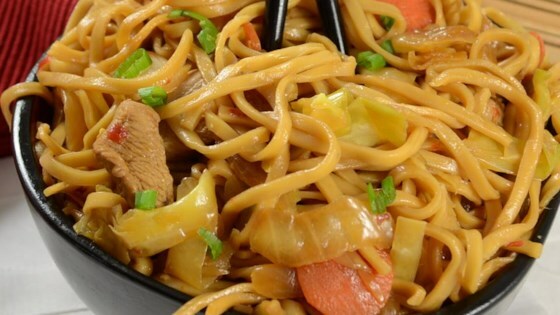 Noodles can be found in an Asian foods market." In a large skillet combine sesame oil, canola oil and chili paste; stir-fry 30 seconds. Add garlic and stir fry an additional 30 seconds. Add chicken and 1/4 cup of the soy sauce and stir fry until chicken is no longer pink, about 5 minutes. Remove mixture from pan, set aside, and keep warm. In the emptied pan combine the onion, cabbage, and carrots. Stir-fry until cabbage begins to wilt, 2 to 3 minutes. Stir in the remaining soy sauce, cooked noodles, and the chicken mixture to pan and mix to blend. Serve and enjoy! It tasted awful. I threw it away.